RRs Unit Converter is an useful tool for metric conversion, weight conversion or any other unit conversions performed by scientist, engineers or students. Simple or compound units. User defined database. Over 1000 units with definition. User defined simple and compound unit conversion like Fuel Consumption or Price Conversions( USD/gallon to Euro/liter).Expandable database - Define your own units or even create your own database. 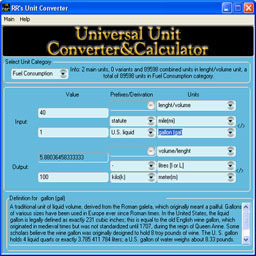 Universal unit converter and dictionary with over 1000 units. ...... You may even create categories of units and add your own simple or compound units to the database. By using a careful developed algorithm, unit conversion factors could be defined between any two units. This feature allows you to use the most precise known unit conversion factor between two units. Therefore, any unit conversions will be performed with high precision. Unit Converter that supports conversion of various units and measurements. Given temperatures of both shell-side and tube-side fluids. The simplest and convenient Unit Converter to convert any units you require. Qweas is providing links to RRs Unit Converter 3.1 as a courtesy, and makes no representations regarding RRs Unit Converter or any other applications or any information related thereto. Any questions, complaints or claims regarding this application RRs Unit Converter 3.1 must be directed to the appropriate software vendor. You may click the publisher link of RRs Unit Converter on the top of this page to get more details about the vendor.